It’s been a while since we published the last technical poster about Veeam technologies but please don’t be sad as I’m going to fix that right away! Let me introduce you to a radical update to Veeam recovery scenarios technical poster. The last one was created almost two years ago and contained 47 restore scenarios of corresponding Veeam Backup & Replication v8. There have been two major product versions since that time and things have definitely changed. 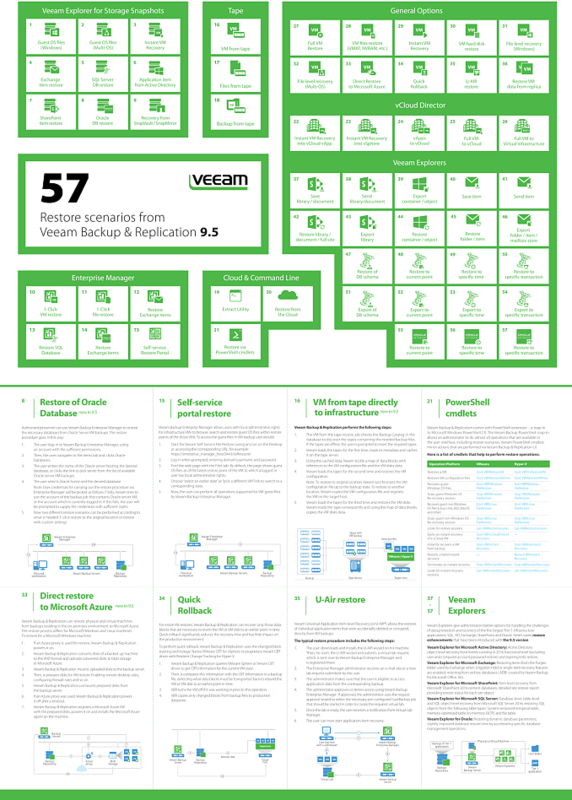 People constantly bugged me asking when we’ll have an update and I’m happy to report that the poster has been completely revised and now you can download its updated version, highlighting 57 recovery scenarios possible with Veeam Backup & Replication 9.5. From first glance, you’ll find it looking very much like the previous one but as always the devil is in the details. Key differences with restore options are related to Oracle DB scenarios and revised Veeam Explorers block, focusing now on recovery ways instead of possible recoverable objects. In addition to the above, you’ll notice new information about SQL DB schema restore, Self-service portal and Direct Restore to Microsoft Azure. Besides the top blocks, I had to create eight new featured bottom blocks to show new product technologies highlighting “new to 9.5” and what I previously didn’t have a place for. For example, this time I’ve dedicated a special place for U-Air restore, which actually appeared way before all Veeam Explorers and used to be the only way for restore of individual items of virtualized applications. Speaking of Veeam Explorers, the corresponding section is now focused on specific features new to 9.5 as the technology itself is pretty famous and it is much more important to specify what it is that we have within the latest release. PowerShell cmdlets, divided by hypervisor, should be very helpful when you need to do something quickly and there is no time to look up the documentation. Direct restore to Microsoft Azure of a Windows-based machine should provide some insight on how complicated the operation is underneath. There will be much more to come! “How to use” instruction doesn’t differ this time: Print it and hang on your office wall or use it when preparing slides for a technical presentation. For your convenience, the poster is available in A0, A1 and A2 formats. Stay tuned and don’t forget to let me know if you have an idea what technical poster you’d like to get next.